The last two weekends have been busy. I actually took two three day weekends so I could get a bunch of little things done around hte house, starting with the cleaning. Gregg and I have been down sizing everything. It started with going through my games, game consoles, and our books. Over the last three months we have gotten rid of five boxes worth of games and books between us, clearing up some much needed space. We also emptied a lot of the things from our storage that we had been saving for when we bought a house. The house isn’t happening any time soon so it is pointless to keep it. That cleared up more space. You’d be surprised how much scrap leather you get from making leather projects. Gregg has three large boxes of scrap leather that we have been making small projects with. Bracelets, key-chains, etc. But there isn’t enough time to use it all, so we’ve actually been throwing some away, or giving it away in boxes. That cut down on a lot of room. Then there are my crafting supplies. I consolidated a lot into a smaller section of my storage, got rid of anything I hadn’t been using, or which had dried out or expired, and I’m down to a much smaller selection. Next I’ll be putting a bunch of the beads and charms up on etsy I think just because I’m not going to use them, but someone should. I also went through out clothing and threw out a lot that didn’t fit, or was worn out. And we had some old electronics that weren’t working, or we bought newer stuff for, so we took the old stuff to be recycled. The house is so much cleaner. Over all i think we got rid of, recycled, or sold a few car loads of things. It’s made it easier to sort out, store, and keep dusted the things that are left. Writing wise, I updated the print covers of Flight of the Griffins and Witch’s Stand, and ordered some a proof of each of them. For some reason the cover of Witch’s Stand was really blurry so I completely redid it and got it to a much better size and dpi. Now if you order them you should get a really nice looking set to have on your shelf. Speaking of shelves, I don’t have most of my books in print because a lot of them are on the short side, but I still wanted to have a “shelf” of my books available. So I made these two posters for that purpose. Most of my book covers are on here, and I’ll do a third when I get enough books out. For right now you can download this if you like. I have to get more ink before I can print the second one, but it is really nice having them above my desk to remind me to keep writing. Speaking of writing….I’ve almost finished “Ghostly Intentions,” which is a little fantasy ghost story I’ve been working on. 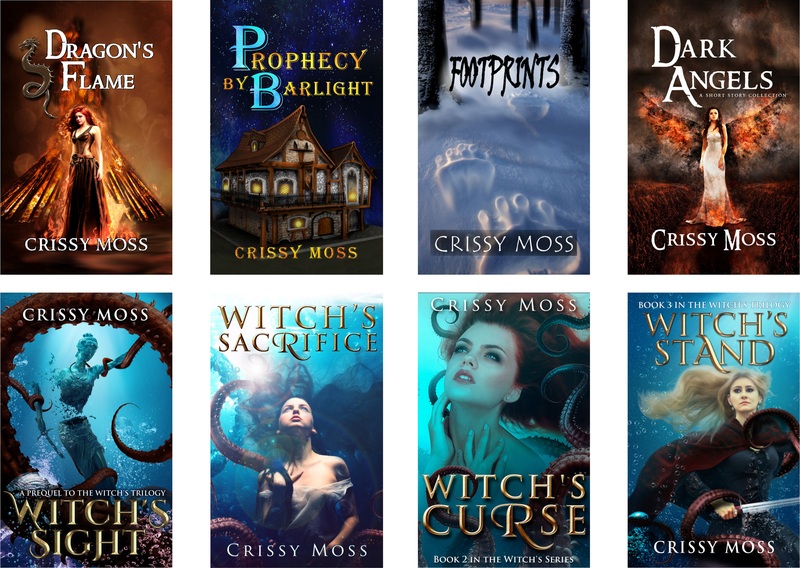 I’ve also edited half of book two in my Half Blood Sorceress series. I’m still debating on the name, either Dragon’s Blood, or Dragon’s Touch. Both would be appropriate, and there are several more in the series so it will all have dragon names. Appropriate in a world where magic comes from dragons, I think. As for art…I haven’t been doing as much of it lately. I did some sketch’s that were kind of cute, but really I do most of my drawing at work, and work has been so busy lately that I haven’t had time to think, let alone sketch or draw. Also another reason I took some time off work. I needed a chance to breath and be myself for a while. Anyway, I get a new shift starting in a month or two, so I have no idea what’s going to happen after that. For right now I’m just trying to do what I need to do. And writing more, that’s the good part. My daughter came by with a friend today so I started clearing some of my clutter by giving her things that she loved. Some of the pop figures, and a dagger, a few shirts that didn’t fit me but do fit her. It was good. Cathartic even. I’ve got a number of things already packed up and ready to be taken to various places to sell or donate. But doing that is sometimes tougher than it appears to be. Time, effort, motivation. That’s what you need, right? I know it sounds so easy. Pick up a box, put in in the car, drive it to x store and sell it. But sometimes I look at all the things that need to go, and the filed house still waiting to be taken, and it’s so over whelming. Video games, board games, hundreds of books, figurines, miniature bottles…I’ve been collecting for a very long time. And I’ve already started thinning things out and it helps, but boy is it overwhelming. One room, one item at a time. That’s the trick. So I think I’m going to have to just do that. Start with a shelf, clean out the ones I don’t want, and take them directly to the car instead of storing them in the closet. It’s so easy to ignore a box in the closet, but a box in the car in the seat next to you…not as easy to do. Especially when you start getting a lot of boxes. I have a nice plan for the tiny home, and it looks affordable if we buy a premade shell, with the wiring and plumbing in it. But where do we park it? And how do we deal with the internet issue? That’s the next big hurdle after clearing out our stuff. Decluttering continued yesterday, and this morning. I cleared out all my craft drawers in the living room, threw out some paints and pencils that were no longer in great shape, and sorted everything. I still have a lot of crafting supplies. I’m going to have to decide if I want to keep them all. Am i actually going to use them? Or am I just holding onto them because I occationaly enjoy using them? I also started with one bookshelf and I’m going to be working my way around the room to the other book shelves. I’ll need to get a couple boxes because I’m going to be getting rid of a LOT of these books, and downlaoding the ones I like the most on ebook readers. Some of them I might just add to a wish list so I can pick them up from a library later. It’s clear, though, that I don’t intend to read all of these anymore. How can I? I have other things going on in my life, and there are hundreds of books in this house, and almost a thousand on my kindle. I do love reding, and I read a lot. But the days of collecting because I think a book looks amazing is over. I just don’t have the room for it anymore. Sad, but true. On the writing front, I finished editing another chapter last night, and then I came down with something. I’m almost certain that I ate something that did not agree with me. I can’t decide what it was, but it was acting a lot like a slight case of food poisoning, or an allergic reaction to something. So I went to bed, and slept early. Then I woke this morning feeling much better. Today they were painting the staircase just outside my apartment so I we were not supposed to leave the house until 5pm. That was easy enough, the paint smells terrible. 5min – Day 9 – Decluttering Begin! Today I started on the path o getting rid of half my things. I just cleared out my dresser in the bedroom, started washing and folding all the clothes, and getting rid of anything I don’t wear anymore. Well, except for a couple t-shirts I stuck aside because I love the design on the front, but they don’t fit. That will be a new blanket soon. Then I cleaned the living room. I threw away another garbage can filled with random things I haven’t seen in years. After finishing with the clothing I’ll have to start on my crafting goods. Paints, clay, beads, findings, fabric, and so many other things. I need to pear down to just what I will actually use, not what I might use some day. And considering the last few years and how little crafting I’ve done, that’s a lot. On the other hand, I think I’ll be setting aside at least one day a week just to do crafting. I love paintings, beading, sewing, and various other crafts. And I’ve been doing more of them lately. I just bought a button maker, and I have sticker sheets and magnet sheets so I will be making all of those with the little drawings I’ve been doing. I think I’m going to fill up my etsy shop again, and maybe sell a few. It will be a while before I actually make money from writing fiction. Well, I should say money enough to live off. Right now I do make some money, but it is just enough to pay for editing the next book. So I thought getting into etsy again might help pay for the editing too. Anyway, my five minutes are up now. 5 Min – Day 6 – What’s free? Last night I finished editing two more chapters for Dragons Flame, and wrote the last chapter. That last chapter had gone incomplete for a while. But this get’s me even closer to the end of the writing. I also did a bunch of newsletters to let people know about the free short stories this weekend. 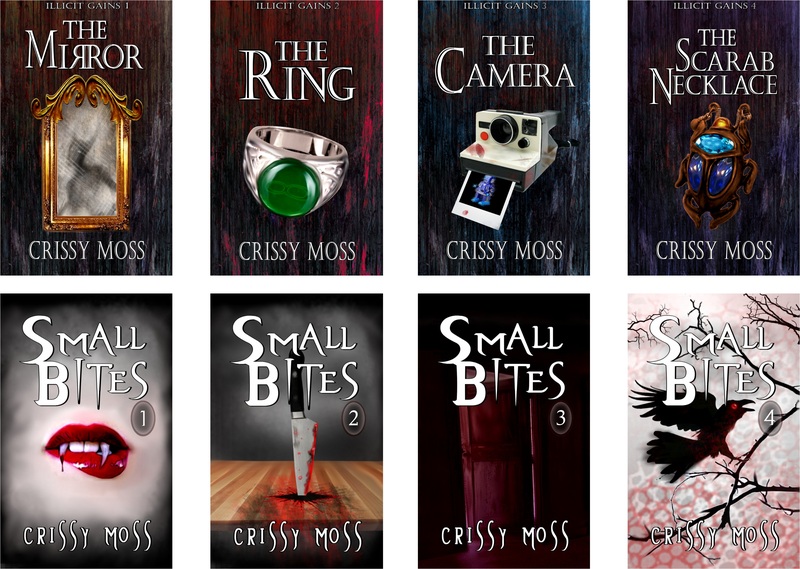 If you’re interested you can find them here: Small Bites 1 and Hidden Treasures for free this weekend, and Witch’s Sacrifice is back on sale for 99 cents, along with most of my short stories being 99 cents. But no progress on the declutter front yesterday. Life is about balance, trying to find that sweet spot of work, chores, family and everything else you have going on in your life. And so I’m trying to do that. I know I work from 12:30 to 10:30 five days a week, including the commute to and from. I know that I have some time in the evenings with Gregg. And I know that in the morning I am carving out five minutes for this blog post. The other things, like writing and reading, and playing a game, or decluttering my life…those all take second fiddle to the facts of keeping a roof over our head, and spending time with my boyfriend so we don’t feel like we’re ignoring one another. Some days I wish I could go back to being a house wife. I had a lot more time then, and would sometimes spend weeks just doing spring cleaning. Sometimes you have to spend a lot of time to find all those little nooks and crannies where soup or spaghetti found their way. Especially when you have toddlers. Maybe I don’t have toddlers anymore, but I do have a house filled with stuff. It’s been almost a week and I’m still doing my morning pages. Yesterday I worked on cleaning up a bunch of art work so I could use it for things like buttons, stickers, and charms. I know, it’s not that interesting, but I use to sell them on Etsy, and they are fun to make. If I ever can support myself as just an author it’s going to take time. I just don’t write quickly, and I am terrible at marketing, so it’s going to take persistence and finishing more work for me to actually get to the point where I am making enough from books to not have a second job. That’s where the art work comes in. The little pictures are cute. There are all sorts of things from superheroes to girls on the beach, and little penguins. And I use to actually sell these things, so maybe I could make a little money from them now. Will I make a lot? Probably not. But I enjoy them. I really love the button maker, and stickers and charms are just fun. So there you are. The other thing I did yesterday was clean u a bunch of paperwork and other items to clean out the house. Decluttering has become important, so I’ll be picking something in the house to clean every day. A bookshelf, a cabinet, a set of drawers. Anything that I can get out of the house to make it cleaner. And the five minute mark hit just in time because I ran out of things to talk about.